Life as it should Bee! The first time I saw her; one whack and I wanted to kill her right there, but something kept on telling me that I shouldn’t. I didn’t feel sorry for her, but somewhere I just felt that I was wrong. It’s just an insect damn it, said my mind. But still, I just let go of her, and off she flew with a little leaf bud tucked under her bright yellow belly. 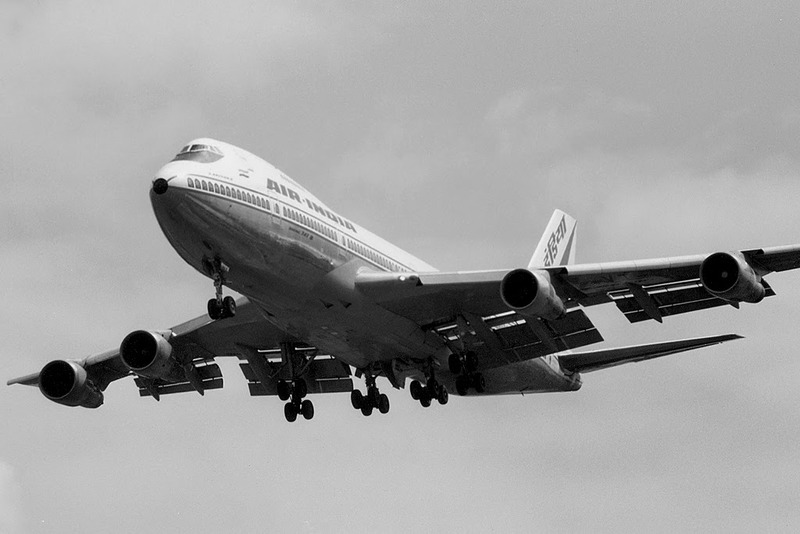 I bet she’s coming back! It was a fine weekend morning; I was just woke up with the sun shining bright on my face and jiggled out of my cozy comforter to stand a while out on the gazing sun. The warmth was as if, it has just tossed a spoonful of butter on an oven-baked bread, it was melting and sinking in slowly. I turned to have a look at the flowers in my garden and slowly gazed down on my bright white jasmine flowers and was stunned to see many of the leaves missing. I was stupefied to see that many leaves from my jasmine plant were either missing or cut in little circles; exact to the shape of a semi-circle. They looked really in bad shape and I was furious to know what really happened and who was behind it. I yelled to my wife and called her out and asked her if she knew anything about this. And she was as clueless as I was. I pulled out a chair and wanted to take a closer look at the state of my leaves. I was saddened by what I saw. My whole plant looked terribly deformed. I pulled in a chair to have a close look at the leaves and why they had cuts of semi-circle on them and while I was seriously looking at it, I heard this little buzz and a small bee like insect just barged in between my two hands and sat on the most good looking leaf. And then before I could shoo it off, she slowly started to cut the leaf in a perfect semi circle; folded the leaf into her belly and before a wink of the eye; flew away. I was truly thunderstruck when I saw this and my heart was beating furiously thinking, the next time I see this damn insect I am going to burn it alive or squash it with a fly swatter. And then I saw around, to all the leaves in my plants, and many of them were torn or either deformed because of this stupid insect. The sun was getting bright, and I took my fly swatter and waited outside, expecting her to come back for another try and probably her last. I waited and waited, but she never came. I thought may be sometime later I will get a hold of her. That evening while I was having coffee, I again heard that little buzz and there again I saw that little devil trying to steal a part of my beautiful garden. I took the fly swatter and patiently waited so that I could be in range of hitting her dead. The time did come, and while I was aiming for her, something just stopped me. I looked closer again on what was she doing, the way she folded that leaf and cuddled it into her belly was astonishing. Why would a bee cut the leaves like this and take them away? Where is she taking it and what is she doing with it? Perplexity took over me. I don’t even know what’s the name of this bee, how am I going to find it? I took to my laptop and started typing the common symptom on what happened to my plant and bang, in the 3rd try I got the answer. 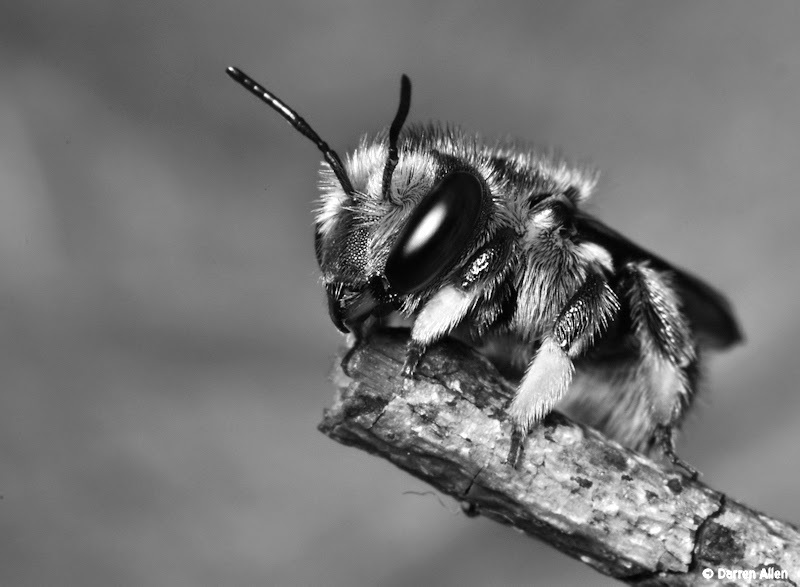 She was none other than a leaf cutter bee, her biological name Megachile Rotundata. 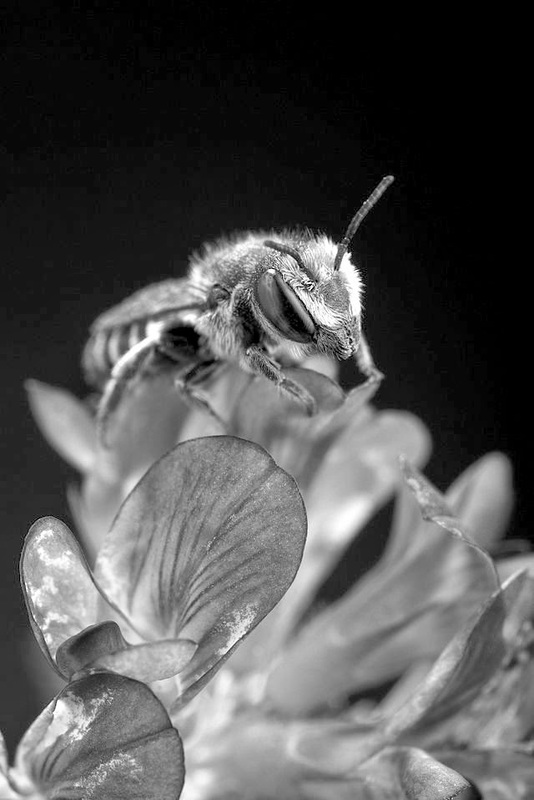 She belongs to a solitary bee species that are found almost in all of the continents. Weird enough, she doesn’t build or is part of any colony or neither does she store any honey. But apparently she is a very effective pollinator. I went on to read further and it said, females that are reproducing create nest in small holes that are composed of a string of individual cells. 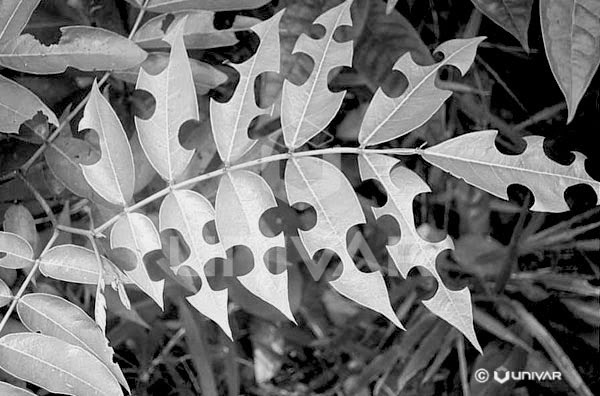 Each cell is made from circular disks cut from plant leaves using her mouth, hence the name ‘leaf-cutter’. 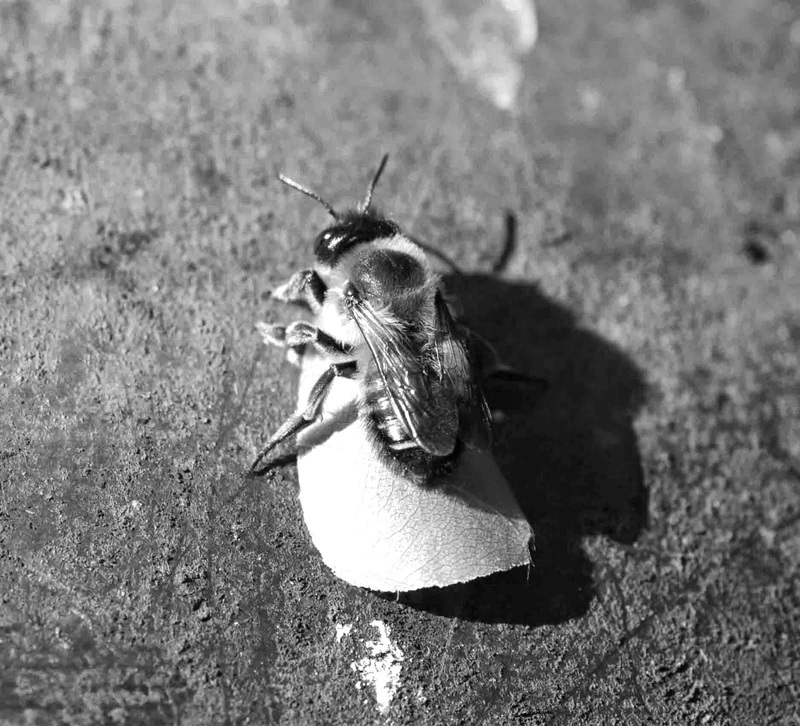 While the bees actually do not store honey or pollen, they do store a few into each cell for the larva to feed on. Now I was in a dilemma whether I really needed a leaf cutter bee around my garden or do I need nice looking plants with good-looking leaves on them. I feel we all get into a point of our lives when the good doesn’t come in a form we like it in. We either churn our teeth and accept or whole-heartedly remove them. 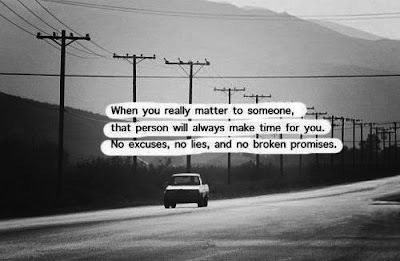 And then there are those times, we neither want them, nor want to kill them. In the following weeks, I stood there many of the evening with the fly swatter trying to whack out the little one, but every time she was in aim, I would take my hand down thinking she’s doing what she has to do for her young. She’s so busy doing what nature has programmed her to do. She didn’t care where she was or what I was about to do to her, but every day, dawn till dusk, she hurriedly came in search of my garden, sat on each leaf, checked for the best one, sat on it; cut it to a perfect semi circle, tucked it into her little yellow belly and left to her nest where she will cuddle the little one into it filled with a drop of pollen and nectar. And that was true; for I never knew there was an insect like this and I never knew she could cut leaves with so much precision and I would have never known that my plants needed her as much as I needed them. 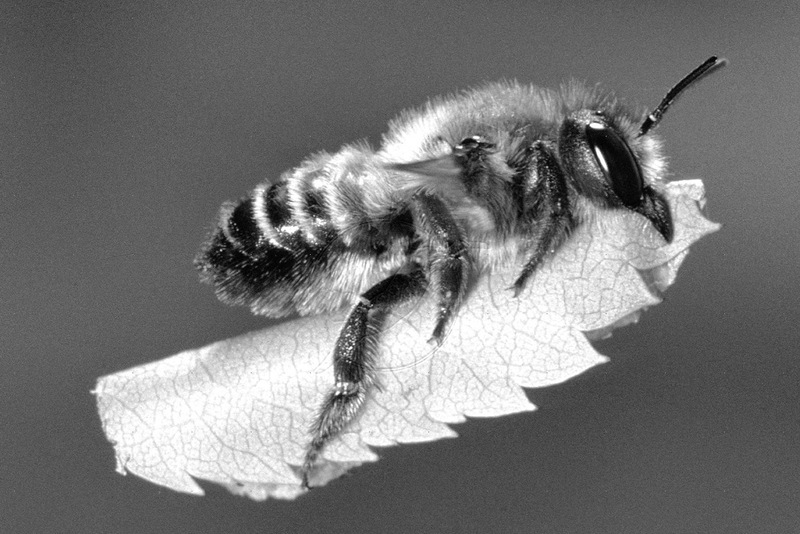 Leaf cutter bees are some of the best pollinators and they do no harm to the plants by cutting their leaves. May be the aesthetic beauty goes down a little, but in the end you have a beautiful flowering garden which becomes a pride for you and you alone. I looked back at my stupid actions, but I feel nice to know that it wasn’t late after all. May be with life, the same things happen to us, we do not foresee, we do not look closer, or may be we don’t bother to know more on many issues which on the outside just look as mere rotten problems which don’t need any attention at all. But deep within lies a purpose, an enigma of details, which will make the difference in our lives. The problems may be big or miniscule but when we look closer; that’s we get that profound vision to know more on the unknown. The next time you see anything, and if you feel it’s a problem, look closer, understand it better, for; things aren’t always what they seem. As for her; she flew away, had kids and my garden looks a little clumsy with cut on leaves but it blooming and beautiful to look at. There are many bees, each doing precisely what they’re supposed to do. I sit beside them watching them zoom over, knowing that nature can never be questioned, but just understood; the same way our lives can never be understood, they can just be lived well. “Aerodynamically, the bumble bee shouldn't be able to fly, but the bumble bee doesn't know it so it goes on flying anyway.” We all know our lives will eventually end one day, but still we fight, struggle and survive and that journey is what makes it all worthwhile." you have beautifully linked a cute incident to something thatz very vital and grave in life.